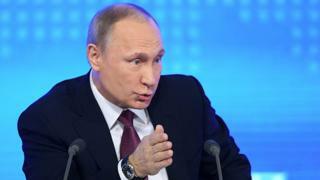 Russian President Vladimir Putin has suggested "patriotic" Russian citizens might be engaged in hacking. Such individuals might be joining "the justified fight against those speaking ill of Russia," he said. Like "artists" who get up and paint all day, he added, hackers spend their day attacking adversaries. Mr Putin also denied once again that his administration hacked the US election last year. He added that this activity was "never" carried out at the government level and he expressed his belief that hackers could not influence voters' minds. Some US politicians have suggested that Russia may have been involved in an attempt to sway the presidential election. In March, the FBI confirmed that it has been investigating allegations of Russian interference. The probe is examining potential links between Russia and Donald Trump's campaign. President Trump's administration has denied that there was any collusion. In his comments today, Mr Putin pointed out that it would be possible for someone to unleash a string of cyber-attacks in such a way that made it look as though Russia were the source.